At last - the oak posts marking each of the garden 'rooms' have been installed. The mammoth task, taking two people five days to complete marks the end of a project that thousands of Hidcote visitors will be able to enjoy. No longer will volunteers find lost souls wandering aimlessly around the garden trying to find the way out! Oh dear, poor Sarah our increasingly frustrated Kitchen Gardener! Not only have the garden's resident population of wild rabbits dug underneath the fence surrounding the new Kitchen Garden, they have then decided that her crop of sweet peas were far too good to miss. Over the past few nights they have been happily munching their way through most of the peas. Luckily some still survive so all is not lost. No, we haven't been reducing our visitors to tears. Following the beautiful Spring weather we've been having the magnificent Chinese Handkerchief Tree is blooming much earlier than normal. The white bracts that the tree is famous for have been appearing thick and fast this week. If you haven't had chance to see the tree in all its glory, visit us soon as the display will only last a few precious weeks. The garden has been full of early arrivals this year with the purple flowers from the wisterias in the courtyards also beginning to appear within the past week. 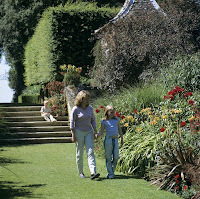 If you're passionate about Hidcote, mark Friday 3 July in your diary. The renowned international garden writer Ethne Clarke will be launching her newly revised book 'Hidcote - The Making of a Garden' here on the Theatre Lawn. 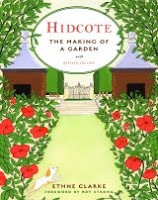 Since the book was first published in 1989, Ethne has been busy delving deeper into Hidcote's history. The newly revised edition sheds more light on the garden as well as revealing more information about Johnston's other garden, Serre de la Madone in the South of France. Join Ethne and Glyn at either 2pm or 4pm on the 3rd for a fascinating introduction to the new publication - followed by an exclusive book signing. A day not to be missed. It's not everyday that our garden team get the chance to show off their artistic talents, but visitors were been amazed when the new hazel supports were positioned along the Rose Walk. The supports, designed for the sweet pea displays later in the year. were painstakingly woven by gardeners Gordon, Eric and Sarah. A surprised Eric remarked "They do look really good!" As if by magic, the thousands of Narcissus in the Pillar Garden have sprung into life. The flowers are looking fantastic as it quickly becomes one of the most talked about areas amongst visitors. Not to be left behind, the 14,000 tulip bulbs that were planted last autmn are also beginning to burst into colour. It is my favorite time in the garden as everything seems to happen all at once. The garden team had to use all of their muscles last week when four very large European Lime trees arrived ready for planting. The trees, measuring in at a whooping 25ft high and with a root ball weighing over one tonne, were purchased from a nursery near Tewkesbury to replace some that failed in previous years. The new trees won't look out of place in their new home along the Lime Avenue (also known as the visitor picnic area), as they are believed to be at least 15 years old complementing those already growing. The photograph shows James, one of our Gardeners, making the final adjustments! Come to Hidcote and have an Easter Muffin instead! Julie the Cake Baker has been working hard to produce some yummy Easter muffins for us all to enjoy this Easter weekend! So make sure you don't miss out - visit the Barn Cafe or Garden Restaurant for an "Egg-cellent" Easter treat! It will soon be almost impossible to get lost at Hidcote. We've just taken delivery of 40 oak posts, each engraved with the name of one of the various garden 'rooms'. The posts, which will replace the aging and at times completely missing, numbered stakes, will be installed in the next few weeks. The new posts have been designed to complement the garden map and will really help people to find their way around and avoid the perennial problem of visitors getting lost! The installation of the new posts has been made possible by a very generous private donation. It must be nearly summer...John, our eagle-eyed Deputy Head Gardener, spotted the first swallow of the season in the garden yesterday! Did you notice the poll on this blog? There are only a few hours left to cast your vote- what's your favourite season at Hidcote? Voting has been furious and it's rumoured that fist fights have broken out between plant sales and catering team members, but we'll just leave that as a rumour. More seriously, this poll was the first one, and experimental. If you were too late and didn't get a chance to vote this time, you'll have another opportunity soon. We may use the polls to gauge views on projects and the future of Hidcote, so keep checking this blog for updates, and post your vote. You can send suggestions for future polls by commenting on this post. (Click on Comments under this post for instructions). It's all taking shape in the Kitchen Garden. The espalier frames which have been built by the talented blacksmith, Dave Broadbent are now in place and have had their protective coat of paint applied. Under the watchful eye of Sarah, our kitchen Gardener, the wires were attached and carefully tensioned, ready to support the new apple and pear trees. Over the next month, 16 fruit trees will be planted. Each of which have been painstakingly grown by the garden team using graft wood taken from the original trees. Our long awaited rainwater harvesting system was successfully commissioned last week. With the completion of the project, it will now allow the garden team to irrigate the thousands of plants using water that has been collected from our spring supply as well as that that has fallen as rain. We can now store a whooping 35,000 gallons of water, which will keep the garden watered for over a month if we don't have any rain at all this summer! Weeds in the Kitchen Garden? Although the first crops are starting to appear above the soil, there are areas that look as though they are being taken over by a blanket of green weed . Panic not. This is actually mustard that has been specifically planted to act as a 'green' manure and weed suppressant. The mustard will be ploughed in later in the year to help fertilise the soil and improve its structure, therefore eliminating the need for chemical fertilisers. On Thursday an enthusiastic group of employees from the catering company 3663 worked alongside members of our gardening team to help with the continued rejuvenation of the Wilderness. During their team building day, the group prepared the tilth and afterwards sowed a special Cotswold seed mix to create a wildflower haven amongst the grass sward. The fruits of their labour won't be seen for another few seasons, but we hope that it will become an important habitat for insects and birds in years to come. What a week it's been for the garden team. Now that spring is most definitely here, the winter wrappings are coming off. The tree ferns in the Fern Dell had their first view of the spring sunshine today as the Hessian was finally removed from their tops. Earlier this week, the bubble wrap that had carefully protected the coping stones around the Bathing Pool was painstakingly folded away (ready for next winter!). Bubble wrap has become a close ally to the garden team who spend hours smothering fragile stone objects from the harsh winter frosts. To top off this weeks' spring preparations, the iconic cordylines have been re-positioned in the Red Border. All ready to complement the magnificent display of spring tulips.